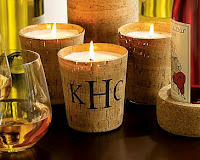 Natural cork is the perfect material for our new candle pot. Sustainable, easy to recycle and environmentally friendly, it’s also naturally beautiful. Our candle pot is filled with the calming scent of wild fern and wrapped with a monogrammable sleeve of genuine cork, combining aroma and texture into one sensory package. 3.5″ diam., 3″ h.